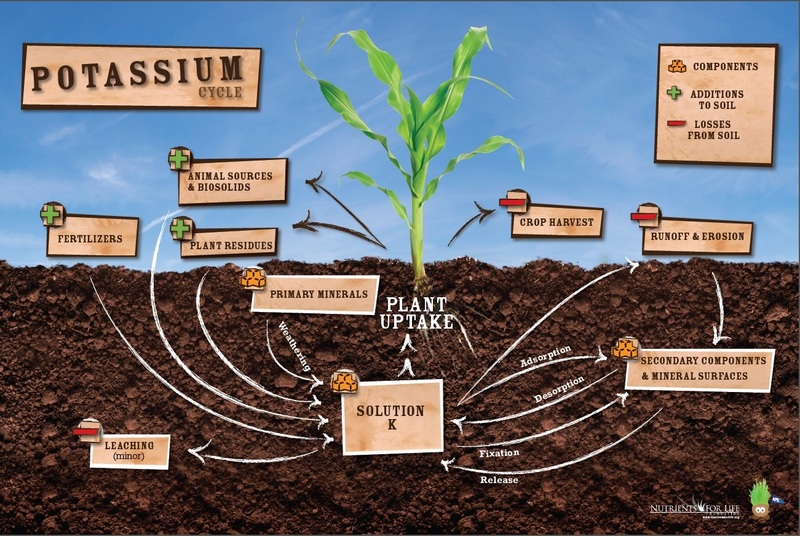 Also, check out our new Potassium Cycle Poster available free through our website. It is so meaningful for science classes to expose students to natural biogeochemical cycles, such as the potassium cycle. Even if students are unable to recall every aspect of the potassium or phosphorus cycle months after your class, the concept of the cyclical nature of earth’s major resources is an essential concept for tomorrow’s generation. Mineral weathering, plant residues, animal sources, and fertilizers supply K to the plant roots. In some soils, mineral weathering primarily supplies enough potassium to provide sufficient amounts of K, with help from plant residues, biosolids, and animal sources. However, continual use of the soil for crops or gardening can deplete potassium faster than natural weather and other sources can replenish it. Runoff, erosion, plant harvest, and leaching can be causes for potassium loss. In those cases, potassium fertilizer can restore amounts. We hope these new resources invigorate your soil science lessons and are a helpful addition to your classroom!